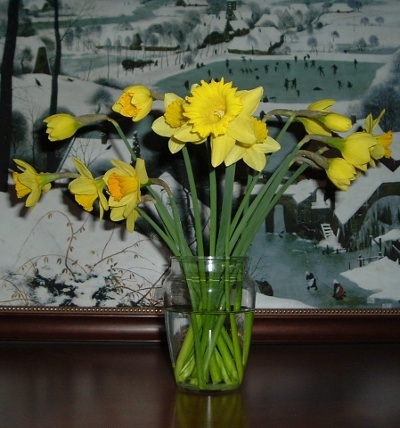 Our daffodils are in bloom, so I picked a few and brought them in to liven the place up. Here you see them against a backdrop of Pieter Bruegel the Elder’s Hunters In The Snow, aka The Family Picture, so called because just about everybody in our family has a print of it. I’m posting at Fatal Foodies today about the book I’m reading, THE PERSIAN PICKLE CLUB by Sandra Dallas. Drop in and find out what a Persian pickle is! A WRITING PROMPT FOR YOU: Give your main character some flowers. This entry was posted in Grab bag. Tagged country life. I’m Not Really Here He-he-he! My daffies have come in, but I don’t recognize them from any years past. They are deep yellow with short orange trumpets. I can’t recall their growing here before. A strange spring, indeed. Here, too. By this time last year, the crocuses and daffodils were gone. I’m kinda lovin’ the long lead-in. 🙂 I wouldn’t, if we had snow, though. I am SO through with snow for the year! It’s kind of you to say so, Veronica. If you can teach anybody how to use that damn ribbon, I’m YOUR fan! Actually, we just shove them in the ground and let them grow as they will. Don’t you have daffodils in Australia?